Big week – both girls started settling in at school and nursery, so finally getting back into a routine. B had no trouble at all, and T’s first settling in session was probably the most restful hour I’ve had since The Big Move. I got to sit back on (another) enormous bean bag whilst T and her new friends romped about playing with adorable wooden building blocks that looked like they were actually bits of a tree. Makes a nice change from the insidious bright plastic toys you see so much in the UK. 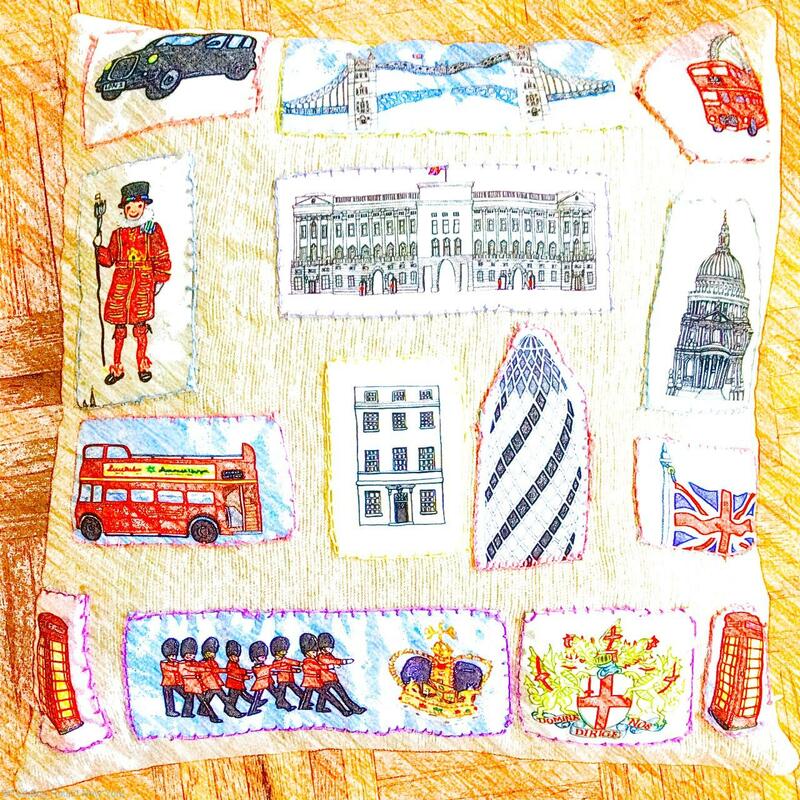 Over the summer, T’s new school asked all the children to make a cushion that reminded them of home, as a comforter. “T” (i.e. me and her grandmother) duly spent a good 20+ hours stitching this little beauty. Many thanks to Julia at Pickwick Papers in Greenwich for getting hold of some curtain samples with lovely drawings of London. T got to choose which to put where – a Beefeater standing guard outside Buckingham Palace, a bus heading to 10 Downing Street. She also helped to pick and dry some lavender from our garden, so it smells of home. Wonder if she’ll always associate the smell of lavender with Greenwich, now? That’d be quite nice. So the cushion is currently wedged in her little cubby hole next to her two changes of clothes, suncream and water bottle. Now that we’ve been here a few weeks, we’ve started to explore a bit further. Took the free Staten Island Ferry across the river and back to see the Statue of Liberty close up. Read somewhere it was described as one of the world’s best, shortest and cheapest cruise trips, and have to agree. The ferry’s a bit on the shabby side, perhaps, but it is FREE, the pier is air conditioned and has public loos – what more could you want? By way of comparison, we also paid just under $30 each for an hour long river tour, but should have saved our money. The view was very similar to the Staten Island Ferry, but there was no shade on the top deck so we all wilted. Oh, and we got completely crowded out by tourists taking selfies, which didn’t happen on the Staten Island Ferry. We duly packed waterproofs and I had B in the sling – every now and then she’d peer up at me and say “Eyes, eyes” when the rain got in her face, bless her. Eventually took shelter downstairs, and every time the bus driver braked, a little waterfall poured down the stairs and sloshed all over the floor. ‘Drenched’ would be the word. On reflection, I’d say it’s not really worth paying the money for a bus tour, as even after haggling it’s still pretty pricey, and you’re getting just as good a view on the normal bus (all airconditioned). So my tip would be: Don’t bother with the tourist boats and buses – just take the normal public transport (avoiding rush hour), and talk to the passengers about where to hop off. In other news, T and I finished reading ‘The Lion, The Witch and the Wardrobe’ last night. She wants to know what Aslan eats, since he clearly couldn’t eat any of the animals in Narnia. Confess I’m stumped. What would Aslan eat?